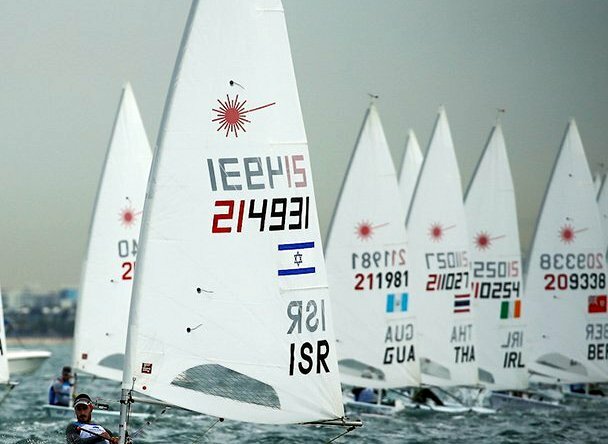 Bermuda’s Cecilia and Michael Wollmann competing in the Nacra 17 Mixed Class and Benn Smith competing in the Laser Men’s Class were back on the water on Day Two taking part in the Hempel World Cup Series in Miami. It was another tough day for the Bermuda Sailors, but both boats moved up the leaderboards. The Laser fleet, the largest of the regatta with over 100 entries, sailed two races today to finish its qualifying series. Tomorrow, the fleet will split into Gold and Silver Fleet racing. Two U.S. sailors are well positioned for a run at Sunday’s Medal Race having each scored all top-10 finishes in the qualifying races. Chris Barnard is seventh and Charlie Buckingham is 12th. But just five points separate fifth from 15th in the always-competitive class. Smith came off the water after two races on the day and four in the Series in 69th place up 7 places in a fleet of 101 sailors. Smith would finish the first race of the day and third of the Series in 27th, he would then finish 31st in the second race of the day and fourth of the Series to finish with 86 Net Points. The Nacra 17 class squeezed in two races toward the end of the day and there is now just four points between the top three American teams. Sarah Newberry and David Leibenberg lead the way in 11th place with 40 points. One place, and three points behind, are 2016 Olympians Bora Gulari and Louisa Chafee with Ravi Parent and Caroline Atwood a point further back. In a fleet of 27 sailors the Wollmann’s ended the day in 22nd place with 71 Net Points after five races. The Wollmann’s would finish the first race and fourth of the Series in 11th, before finishing 15th in the second race of the day.